Summary: Since 2001, Loggerhead Marinelife Center biologists have conducted a leatherback sea turtle mark-recapture program along one of the most important leatherback nesting beaches in the United States. Approximately 25% of nesting in the state of Florida takes place on this stretch of beach. This program allows biologists to answer many questions about a previously poorly understood population. To date, 538 turtles have been tagged using metal flipper tags and PIT tags. 39 of these have been tracked using satellite telemetry to investigate internesting movement and post-season migrations through independent projects and collaborative efforts. This study has allowed researchers the opportunity to determine important population parameters such as internesting interval, clutch size, clutches per year/individual, morphometrics, and nest success. It is important to continue this work to better understand survival rates, age to maturity, nest site fidelity, state distribution, and total population size and provide these parameters to state and federal agencies to create effective management plans. Loggerhead Marinelife Center has developed a highly efficient and cost-effective monitoring program using the latest technology to enable researchers to identify and tag individuals and conduct saturation tagging on an extremely dense nesting beach. Funding provided by the marine turtle grants program will allow us to upgrade equipment and purchase newer technology. Results: Due to permitting issues, the project that was planned to be completed in 2014 could not be completed until the 2016 nesting season. Work completed during the early portion of the project has been reported previously (6-month Report). From March 14 through June 17, 2016, Loggerhead Marinelife Center (LMC) staff monitored Juno Beach (9.7 km) five nights a week (Sunday–Thursday nights) from 9 pm–6 am with the goal of documenting and sampling nesting leatherback turtles. A total of 71 leatherbacks were encountered, including 14 previously undocumented individuals. Undocumented individuals were tagged with both flipper tags and PIT tags purchased by the project and previously tagged individuals that had lost flipper tags were re-tagged with purchased tags. Some limitations were encountered with the field computer and tag scanners. A Windows Operating System had to be installed on the Trimble T41 due to the lack of data collection software that is compatible with an Android Operating System. Once the Windows Operating System was installed, TerraSync was able to be utilized as the data collection software. Another challenge was that the LiveTrack PIT tag scanner was only able to read 134.2 kHz FDXA PIT tags, despite being advertised as able to read 134.2 and 125 kHz tags. Since most of the tags previously deployed in leatherbacks from Juno Beach were 125 kHz TX1406L PIT tags, we then had to scan the turtle with a different scanner if no tag was initially detected. The scanner also cannot scan the same PIT tag twice in a row. This is limiting if one is deploying a new tag because convention dictates that the tag is scanned outside of the turtle and then scanned again after deployment to ensure that it reads properly. The LiveTrack scanner needs to be turned off and back on again to read the same tag, increasing the amount of time spent with the turtle. We were also unable to access the entire historical database in real-time on the field computer, which would require a custom-built app. Instead, we uploaded a text file to the Trimble T41 and searched within that document for a turtle’s tag numbers to gain access to the turtle’s history. In the future we plan to modify the leatherback database from MS Access to a SQL database to allow direct entry from the field to the database. Since the equipment for this grant was purchased, we have found a new PIT tag scanner that is also Bluetooth enabled but without the limitations of the LiveTrack scanner. The new scanner is a Biomark GPR Plus Global Pocket Reader; however, the manufacturer has not yet launched the software to allow a Bluetooth connection on the device. Once the software becomes available, we recommend the use of the Biomark GPR Plus scanner instead of the LiveTrack scanner if other groups would like to use these methods. 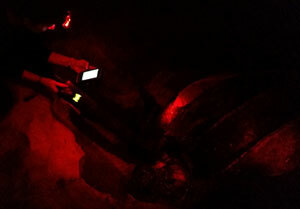 Overall, this grant helped LMC’s The Leatherback Project by improving our technology and accuracy of data collection. By eliminating the use of paper data sheets, we reduced our waste and time spent transcribing data later on; we also reduced the number of errors in transcribing data from paper sheets to a computer-based data system. Having a PIT tag scanner directly connect to the data collection software reduced the likelihood of errors in reading tag numbers as well.